In a post-apocalyptic future, 24 teenagers must participate in a reality show in which they must kill or be killed. That is the premise of The Hunger Games, a young adult (!) 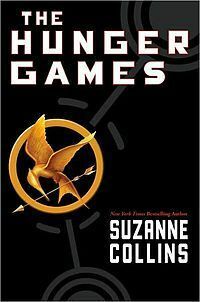 novel by Suzanne Collins. The book is set in the country of Panem, which occupies what was once North America. In Panem, 12 districts surround the Capitol, the seat of government and power. The protagonist of the book is 16-year-old Katniss Everdeen, who lives in District 12 (formerly Appalachia), one of the poorest districts. Her father has died five years before, and her family now consists of her younger sister Prim—whom she loves—and her mother,whom she has contempt for. In fact, with a few exceptions, Katniss has contempt for most people she meets. For the benefit of those who would like to read the book, I won’t get into many plot details. I will say that Collins is a skillful storyteller, and it was easy to keep reading. I will also say that, for reasons other than Collins’s storytelling skills, the book was a disappointment for me. I felt that Katniss was not a likable protagonist from the beginning, and she did not change significantly over the course of the book. The book comes across as deterministic in the way that it presents the world. There are no surprising twists (Actually, let me clarify that. I shouldn’t say that there are no surprising twists; I should say that I was not surprised by the twists that were there. I don’t want to ruin it for people who haven’t read the book, so I won’t go into details. But there were a few points in the book where it seemed like Collins wanted the reader to be surprised, and I wasn’t.) The Capitol is in charge and no one can do anything about it. The only thing anyone can do is look out for the welfare of themselves and the people they care about. In this way, it reminded me of Thomas Hobbes’s description of the state of nature, where it is a war of all against all, and life is “solitary, poor, nasty, brutish, and short.” Hobbes says this condition obtains where there is no single power to keep everyone in awe. I heard Collins saying, through her story, that this condition also obtains where there is a single power, but it is in that power’s interest to deprive others of any kind of security. This Myth of Redemptive Violence is the real myth of the modern world. It, and not Judaism or Christianity or Islam, is the dominant religion in our society today…. No other religious system has even remotely rivalled the myth of redemptive violence in its ability to catechise its young so totally. From the earliest age, children are awash in depictions of violence as the ultimate solution to human conflicts. Nor does saturation in the myth end with the close of adolescence. There is no rite of passage from adolescent to adult status in the national cult of violence, but rather a years-long assimilation to adult television and movie fare…. While the myth of redemptive violence pervades our world, it is not present in the world of The Hunger Games. There is no sense that violence from the “good guys” is an adequate response to violence from the “bad guys.” All violence in The Hunger Games is disturbing, and that’s a good thing. Unfortunately, though it does not glorify violence, the world in The Hunger Games is presented as a hopeless place. The cycle of violence cannot be broken, even though violence isn’t presented in a positive way. If I were the parent of young adults who read this book, I would probably want to help them appreciate the negative presentation of violence, but also talk to them about the deterministic (or possibly fatalistic?) worldview of the books, and whether it accurately depicted the world as it is. I don’t believe that it does, but I do believe that there are many determinists among us. Collins, apparently, is one. I am not sure that I would say that this story is from a ‘deterministic worldview’ akin to Hobbes description of the state of nature. If anything, Collins is commenting on the nature of the state and political corruption. I hear more Chomsky than Hobbes. But I agree that I didn’t find Katniss a compelling protagonist. To my mind the second book (Catching Fire) is the best of the series, but the finale defies the rules of credible fiction for me. Maybe you’re right; maybe I am imputing determinism to Collins when that isn’t entirely what is going on. At any rate, there is a lot more despair than hope in this book. When I was a teenager, I was as moody as they come. Reading something like this wouldn’t have helped me shape a healthy view of the world. I am interested in seeing how they make it all “pg-13” in the film adaptation. Because, you know, kids killing kids is kind of brutal. THG was a page-turner. I got tired of the whole thing halfway through Catching Fire, and I haven’t read Mockingjay. Most if not all of our middle/high school students have read the series. I agree with your statement: “Reading something like this wouldn’t have helped me shape a healthy view of the world.” I should ask them how they feel about the themes.